Happy Halloween! The two-day Fed meeting kicks off today, with the monetary policy statement being released tomorrow. Does that come as a surprise to you? That’s because nobody’s talking about it. Though there is always a possibility of a surprise attack tomorrow, all ears are awaiting for the promised rate hike at December’s meeting. Lastly, the Case-Shiller Home Price Index shows an annual gain of 6.1%, up from 5.9% last month. The Case-Shiller Index tracks 20 major cities across all nine U.S. Census divisions and tends to be a little late to report, making it one of the more accurate measures of home price fluctuation. The first look at 3rd Quarter GDP shows that the U.S. economy expanded by 3.0%, which is better than the expected 2.5%, but not quite as solid as the last review of the 2nd Quarter, which showed a 3.1% growth rate. Whether or not these gains hold in future readings, it’s the first time in three years that we’ve seen an increase of 3.0% for two consecutive quarters. Cynics argue that vendors are ramping up inventory for the holiday shopping season, artificially inflating the numbers. I’d counter that contention by pointing out that any preparation for a big fourth quarter should be a surprise to no one as Christmas rolls around once a year and has for two millennia. There are reports out that President Trump has narrowed his choice for the next Fed Chair to either Jerome Powell or John Taylor. Though the former would be more likely to keep interest rates low, consensus still calls for three rate hikes next year, and for Janet Yellen to finish her tenure with another 1/4% bump this December. So keep your personal share of retailer inventory reduction in check because your credit card statement is going to be more naughty than nice going forward. There is still hope in Washington that the Senate will be able to pass a new budget to facilitate a reduction in our income tax brackets–so there’s still hope for ever higher consumer spending in the future. The S&P 500 has closed at record highs 67 times in 2017, the most highs in 20 years. The index is also on its longest streak ever without a 3% correction. I still see a rising interest rate environment as being a drag on Stocks for two reasons. In the first place, rising bond yields will be attractive to investors whose portfolios have become bloated with equities and they want to re-balance to protect the gains. Secondly, for leveraged companies (that is, business that have borrowed money for growth), rising interest rates means higher costs, and higher costs means less profit. Less profit leads to a devaluation of your stock price, which is what causes corrections. And make no mistake, higher interest rates are coming. The 10 Year Treasury broke above 2.4%. The 10 Year Treasury looks like it could push up above 2.6% in the next few weeks, which has the ability to drag mortgage rates up with it. I don’t see them in lock step, but up is up. Tell your clients to get off that fence. I talk to A LOT of people who are expecting homes to drop in value. I don’t see it, personally. But let’s say that next spring, prices are down 5%, and over the same time, interest rates have risen 0.5%. An interest rate hike from 3.75% to 4.25% would more than offset the payment of a home with a $15,000 price reduction (on that median priced home), and the buyer will pay more over the life of the loan as a consequence. If you want me to put some numbers together for you so that you can show your clients, I’m happy to do that for you! Today marks the 30th anniversary of Black Monday, where the DOW dropped 22.6% in a single day—the largest decrease ever in the U.S. equities market. That 22% back in 1987 was 508 points. Since then, the index has grown almost 1000%. For the last few years,stocks have continued to hit new highs, capped off by the DOW closing above 23,000 for the first time ever just yesterday. While measures have been taken to ensure that markets don’t crash like they have in the past, one wonders how long the current bull market will last. In their Beige Book publication yesterday, the Fed noted that employment growth, economic activity, and inflation remain “modest”. Looking toward the future, many feel that when Janet Yellen’s six-year term expires next February, President Trump will appoint a new Fed Chair who is quicker to raise interest rates. Should that happen, Ms. Yellen would be only the third Chair in the last 84 years whose reign was limited to one term. Her dismissal would also create the fourth vacancy in the Open Market Committee’s 12 seat boardroom. Where the Commander in Chief appoints these Fed Governors, the future of interest rates really does lie in the palms of the current President’s tiny little hands. Speaking of prices and appreciation, the above graphic shows the history and anticipated future of home prices across the Wasatch Front. Pretty interesting stuff if you are a homeowner. Across the country for 30 Year fixed rates loans, the average FHA rate is 4.0% with .37 paid points; Jumbo loans are at 4.13% with .32 paid points, and Conventional is at 4.14% with .44 paid points. Building Permits as a whole decreased 4.5% last month. While permits for Single Family Homes increased 2.4%, the 16% drop in the Multifamily sector is what brought that overall number down below expectations. Housing Starts also were down 4.7%. The South saw the largest drop in the beginning phase of newly-constructed homes; down 9.3% in September. Interestingly enough, almost half of the new homes built built in the US. are in the South. As with any business, you go where the money is. With the federal government shoveling $14 billion into the cleanup efforts after two major hurricanes, a slower-paced building number doesn’t mean that anyone in the new construction arena is out of work right now in the South. I suspect that many of the resources that had been used to erect new homes are now are being utilized in the post-hurricane clean up effort. The minutes from the last FOMC meeting will be released today, so the Fed is on the front of everybody’s mind. Fed President Charles Evans said this morning that the fundamentals of the U.S. economy are very strong and that we should probably get used to weak inflation because it might not get to the 2% objective. All the same, he is calling for gradual rate hikes. Mr. Evans is widely known as a dove when it comes to policy creation–meaning that he favors low rates and economic growth. And here he is calling for higher interest rates. This Morning’s Jobs Report shows is an interesting one, showing a net loss of 33,000 jobs, where the markets were anticipating a 100,000 gain. It’s the lowest number in seven years. Despite the lack of new help wanted signs, the Unemployment Rate dropped from 4.4% to 4.2%, and the Hourly Earnings rate surged by 2.9% year-over-year, now standing at $26.55 per hour. The net loss in job creation is being attributed to the recent hurricanes, and the markets are focusing on the inflationary impact that comes with the increase in earning power. Consequently, there is a 91% chance that the Fed raises rates in December. So mortgage rates continue to see upward pressure. In the equities market, all three major U.S. stock indices are down a fraction of a percent this morning after experiencing record highs just yesterday. If you are looking to boost your hourly wage way up past that $26.22 average, look into gaining some understanding of and expertise with Blockchain. It’s a technology developed for Bitcoin that allows for the confidential and secure exchanging of information, and everybody from IBM to Walmart wants people who know how to implement the technology. Consider that my PSA, for something I know nothing about. Have a great weekend! One more shout out to my old buddy, Tom. 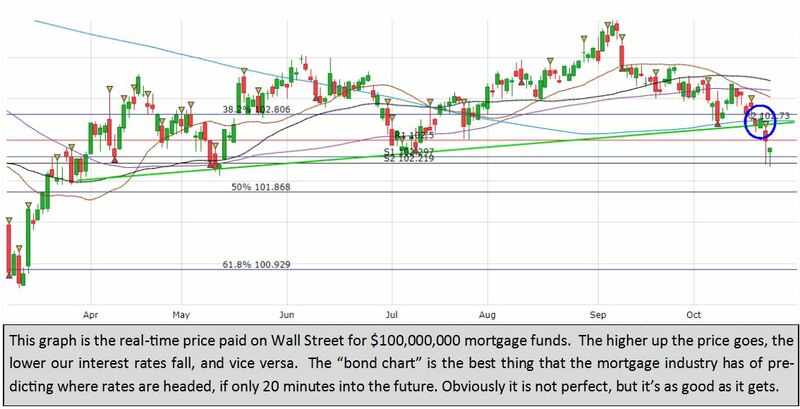 Mortgage backed securities have dropped to the floor of support that’s held since mid July. With the Jobs Report coming out tomorrow, there is a chance that pricing will fall thorough the floor of support. That would cause interest rates to bump up by at least .0125%. One of my favorite feel good rock and roll singers passed away this week from a heart attack. Tom Petty was 66, leaving behind the rest of his band with whom he cut 24 albums over 38 years: the Heartbreakers. Talk about foresight, Tom, you totally nailed that one. Fannie Mae reports that mortgage applications for home purchased are up 4.7% so far YTD, but including refinances, are down 25.3% from this time last year. Interestingly, 25% was the exact decrease in my paycheck that I was planning on from 2016 to 2017. I’d like to think that precognition is on par with Tom Petty. Even the losers get lucky sometimes. R.I.P.